Today's post is a collaboration post with four other fabulous bloggers - Suzanne, Robin, Julie and Nina. Make sure to read to the end for lots of style inspiration. If you have been reading my blog for a while, you'll know that I love faux leather leggings. In fact, I own multiple pairs. The last pair of faux leather leggings I bought is my most affordable one, but I like them a lot. In fact, I like them as much as my much more expensive pairs. I think they are also a great option for those who may be on the fence about faux leather leggings as they are not a huge investment. 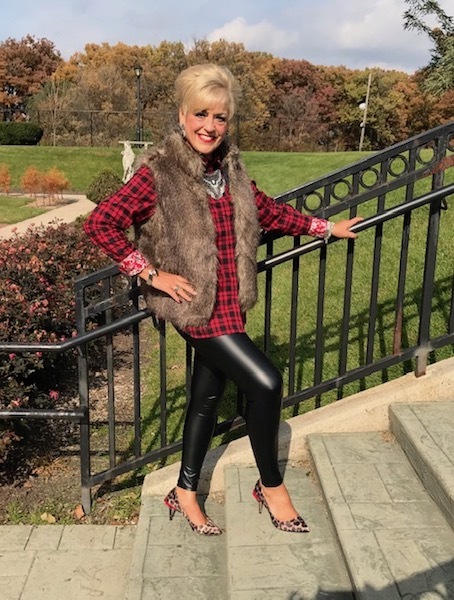 I love faux leather leggings in fall and winter and for the holidays. I bought the Desigual dress in Germany a few years ago and knew it was a bit too short on its own. Since I have a tradition of adding at least one Desigual item to my wardrobe on every trip, and I really liked the dress, I had to find a way to make it work. I think it works well with the leggings. It's one of the holiday outfits I'm going to bring to Germany when I visit my parents in December. I like that the leggings have a ponte back, which makes them very comfortable. 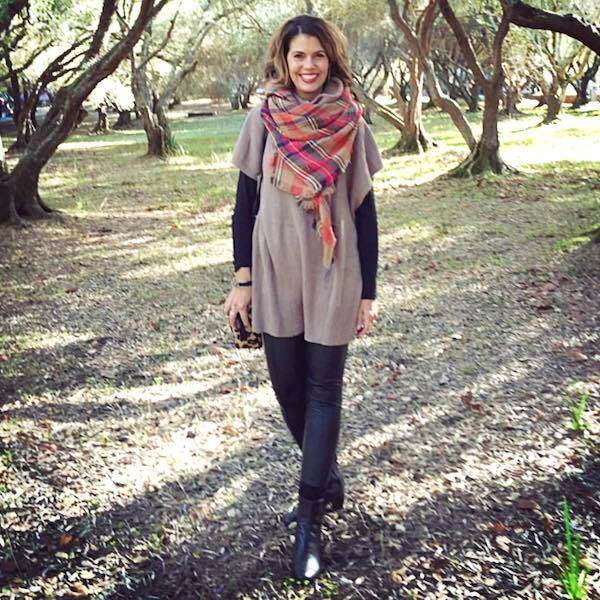 And now on to the other fabulous bloggers and how they have styled faux leather leggings. 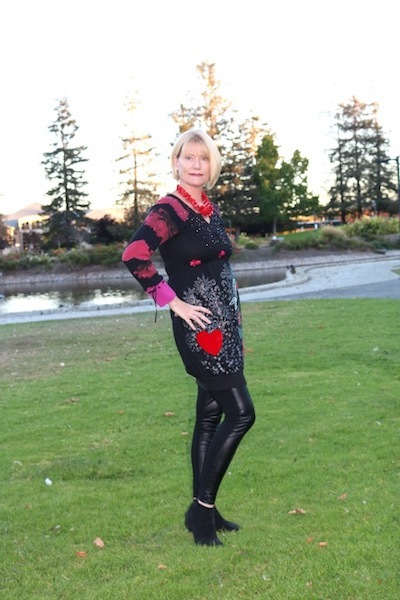 Suzanne from Ask Suzanne Bell always styles faux leather leggings so well. In fact, I bought my other favorite pair of faux leather leggings, Lysse, on her recommendation last year, and I am glad I did as they are still like new after countless wears. 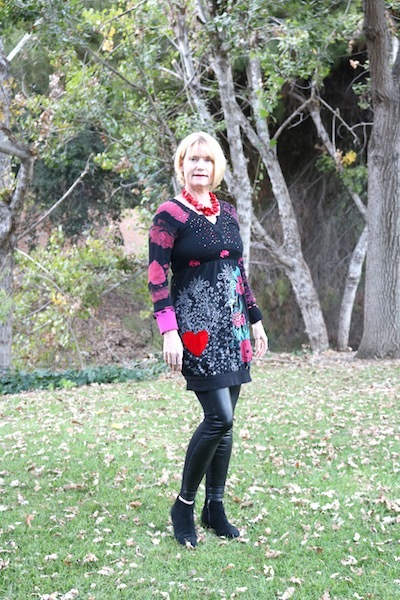 Here are two examples of how Suzanne styles her Lysse faux leather leggings. If you don't already follow Suzanne, check out her blog for great, relatable style advice, follow her on Instagram, and like her on Facebook. Here is a link to Suzanne's blog post. Next is Robin LaMonte from Hello I'm 50ish. Her faux leather leggings are from Chico's. Isn't this the perfect holiday outfit? I so want to recreate this outfit! Here is a link to her post. You can follow Robin on Instagram here and like her Facebook page here. 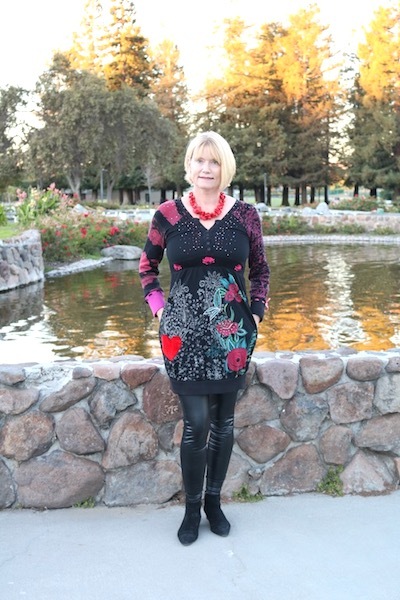 Julie from Fashion Trends and Friends styled a very affordable pair of faux leather leggings from Amazon. Didn't she create a lovely holiday look? Here is a link to her blog post. Follow Fashion Trends and Friends on Instagram here. And like their Facebook page here. Next is Nina from Sharing a Journey. Here is a link to her blog post. I love the pop of red she added to her outfit! It makes it instantly festive. Follow Nina on Instagram here and her Facebook page here. Questions: Do you own faux leather leggings? If yes, what is your favorite way to style them for fall/winter? Do you ever wear them for the holidays? Gorgeous, you are killing it in those faux leather leggings!! Looks so chic! Such great holiday (and more casual) looks! You have very stylish blogging friends! Yes! Aren't they just fabulous?!!! 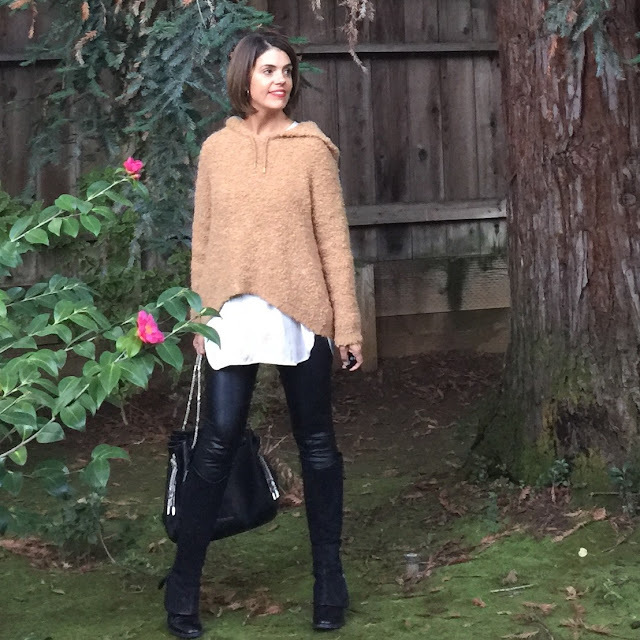 I own one pair of faux leather leggings, and I love all the ideas in this post! I think I'll wear them a lot more now! I think they add a little edge to an outfit.....and we all need that!! Don t you just love faux leather leggings! So chique and stylish! They can be worn with anything, great look Andrea! Hi Andrea! I am thrilled to be collaborating with you and our other blogger sisters on this fun post! I really do believe vegan leggings can be worn anywhere and elevate any look. I LOVE your Desigual Dress. What a fabulous idea to wear it as a tunic for such a fun look. Like you, I plan to try to recreate Robins look with the white shirt and plaid scarf, we have all the pieces so why not? Thanks SO MUCH for organizing this! And, yes, vegan leggings are great! Looking forward to recreating Robin's look! As if I needed more encouragement to get on the faux leather leggings bandwagon! Look at you gals, so sassy and stylish. Getting some of these with my end of month paycheck. Just love how everyone took the same piece and styled it so differently. Bravo! YOu look great in those leather leggings! I love everyone's unique take on wearing them. Your sweater dress is so stylish, i love it as a tunic too. Very smart. All of you. Indeed it is a great way to solve the “just a bit too short dress” issue. I don’t own any of such leggings but I do own similar, one blue and one grey. And one pair of black leather logging trousers. The latter one was quite an investment made in a spur of the moment. I make it last. Yes, leggings in general are great for all those dresses that are a bit too short. Since I'm tall, that happens quite a bit... And, yes, Suzanne does layering so very well.